Secure your property quickly and easily with the latest remote controlled warm white Evo SMD Remote Controlled Solar Floodlight. Works in Winter: -A well positioned solar panel will enable this product to work in typical UK winter conditions. No Mains :This light is solar powered and does not require mains power to work. 12 Month Warranty :-Features a 12 month warranty as standard. Has a manual on/off button. 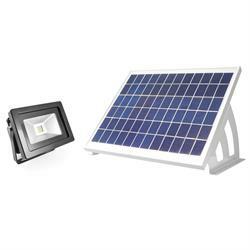 This state-of-the-art solar floodlight can be mounted virtually anywhere in your property with minimal DIY skills and without the need for a mains power supply. The Evo SMD is designed to work in UK winter time and will protect your home each night for free – even during lengthy power cuts. Unlike our motion sensor lights, which only turn on when they detect motion, the Evo SMD Remote Controlled Solar Floodlight offers light on demand at the press of the button. Backed up by a whopping 10W solar panel and 32Wh battery, the Evo SMD RC can function for up to 10 hours from a full charge. The supplied RF remote control has a 50m range and can work through walls and windows without line of sight. Operating the Evo SMD RC is simple. You can either use the light on demand by using the supplied remote control, or you can simply leave the light switched on where it will turn on automatically each night and turn off automatically each morning at first light. Please note that the unit will still charge when turned off. In late Spring, Summer and early Autumn the Evo LED Bulb SMD RC will fully charge on most days giving it enough power to light for 10 hours after dark. In winter the Evo SDM RC will charge enough to light for up to 5 hours on all but the most unfavourable of winter weather days. Why is the Evo SMD RC more expensive than the Evo SMD and Evo SMD Pro? Both the Evo SMD and EvoSMD Pro are motion sensor lights which are designed to come on a few times each evening as and when they detect motion. The Evo SMD RC is designed to stay lit for hours at a time each night which means it needs a much bigger solar panel and much higher capacity batteries. It also uses a remote control which adds to the costs. Buying this product will earn 680 Loyalty Points. Be the first to submit a review for the Evo SMD Remote Controlled Solar Floodlight (S9930).